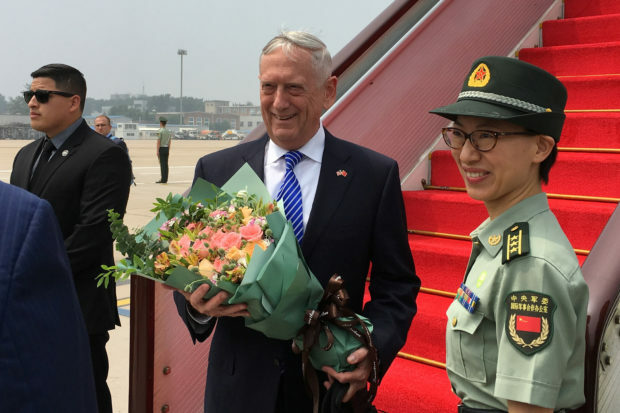 Secretary of Defense James Mattis arrived in Beijing Tuesday for a “conversation” with senior Chinese leaders. When he arrived at the airport in China, he was greeted with a bouquet of flowers. The visit, the first by a U.S. defense secretary since 2014, comes amid rising tensions between Washington and Beijing in both economic and security sectors. The two sides are not only locked in a heated trade war with the threat of hundreds of billions of dollars in tariffs on the table, but the situation in the South China Sea has escalated as well. Mattis accused China of “intimidation and coercion” at a public international security forum in Singapore at the start of June. The Pentagon has expressed serious concerns about Chinese militarization in the South China Sea in recent months, as China has deployed jamming systems, anti-ship cruise missiles, heavy bombers and surface-to-air missiles to Chinese-occupied territories in the contested region. “Despite China’s claims to the contrary, the placement of these weapons systems is tied directly to military use for the purposes of intimidation and coercion,” Mattis said at the Shangri-La Dialogue. There are also tensions over Taiwan, which Beijing believes Washington is emboldening through increased engagement. China’s military has reportedly been drilling off the coast of the self-ruled island for a week. Beijing hopes that the U.S. and China can “meet each other halfway” and make military relations between the two countries a “stabilizing factor” for broader bilateral ties, according to Ministry of National Defense spokesman Senior Col. Ren Guoqiang. One area where the U.S. is expected to push for increased cooperation is on North Korea, as the U.S. needs China to maintain pressure on its old ally until Pyongyang takes real steps toward denuclearization. “Although it is natural for big countries such as China and the U.S. to have areas of competition, the two should have the wisdom and the political will to control their rivalry so that the worst-case scenario of a full-blown confrontation between them can be avoided,” the state-run China Daily explained in an editorial Monday. Mattis is also expected to visit South Korea and Japan.